King James II raised several regiments of Horse and Foot as a result of the Monmouth Rebellion. Sir Edward Hales of Woodcot was commissioned to raise a regiment in Kent. Companies were assembled at Canterbury, Sittingbourne, Rochester and elsewhere in the county. They served in Scotland and then in Flanders where they showed great bravery at Namur in 1695. But this battle honour was not granted until 1910. They served in Gibraltar for many years and were besieged there in 1727. They arrived in Flanders after the battle of Fontenoy in 1745 and marched to Scotland for the Jacobite Rebellion. 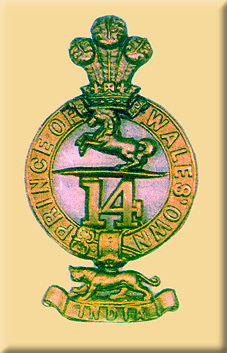 As Price's Regiment they fought at Falkirk and Culloden. They served in the West Indies at St Vincent, then the American War of Independence. When the French Revolutionary army invaded the Nederlands the 14th were part of the Duke of York's army, fighting at Famars in 1793, Valenciennes and Tournai in 1794 where they were part of the 'fighting brigade' with the 37th and 53rd. There they earned another battle honour. As they marched away from Famars their band played Ca Ira, a revolutionary tune, for the first time. They were next sent to the West Indies again and suffered sickness and death there until they returned in 1803. In the Napoleonic Wars the 1st Battalion went out to India in 1807 and took part in the attack on Tranquebar. On their return they were at the capture of Mauritius in 1810. The 2nd Battalion sailed to Corunna and were part of Sir John Moore's army that retreated in such terrible conditions in the winter of 1808-9 and then went on to Walcheren. In 1809 the 14th exchanged territorial titles with the 16th Foot so that the 14th became the Buckinghamshire Regiment and the 16th the Bedfordshire Regiment. The 14th raised a third Battalion in 1813, mostly young and inexperienced men. They fought at Waterloo as part of Colonel Hugh Mitchell's 4th Brigade in General Sir Charles Colville's 4th Division. At the start of the battle they were positioned on the extreme right of the line, near the Nivelles-Hougoumont Road. They held their position all day, forming square when threatened by French cuirassiers. Their casualties were one officer wounded, 7 men killed and 21 wounded. They marched to Paris after the battle, took part in the storming of Cambray, and returned to England in December. This battalion was disbanded in 1816. During the battle the regiment came off lightly for injuries and deaths. The one officer wounded was Ensign Alfred Cooper who was the shortest man in the battalion. Young George Keppel, only 16 at the time, was sitting on a drum holding Col Tidy's horse when a shell hit the horse knocking Keppel over. Among the officers was a dandified young ensign, Charles Fraser, who carried one of the Colours. It was doubted that he could withstand the cannon fire that was going to test them all. At one point a young bugler of the 51st ran into their square and exclaimed, "I'm all right now!" just before a cannon-ball took his head off. Dandy Fraser was covered in the bugler's blood and brains but was heard to say quietly, "I shall have to wash my hands and face after this." The 14th sent out some of its youngsters as skirmishers. They were under the watchful eye of experienced NCOs. They shot at some enemy horsemen and wounded several. When a French Cuirassier rode back to rescue a wounded comrade Private Thomas Witney took aim but was prevented from firing by Sgt Samuel Goddard. He pointed out that the rescuer was a 'noble fellow'. "On the 18th of June the third battalion of the 14th Regiment had the honour to take part in the memorable battle of Waterloo, the character and importance of which engagement, distinguish it as the greatest event of the age, and mark it as the brightest era in the history of the British army. The battalion was composed of young soldiers, who had never before been under fire, but their bearing reflected honour on the corps to which they belonged. During the heat of the conflict, when 1815 the thunder of cannon and musketry, the occasional explosion of caissons, the hissing of balls, shells, and grape shot, the clash of arms, the impetuous noise and shouts of the soldiery, produced a scene of carnage and confusion impossible to describe, a staff officer rode up to Lieutenant-Colonel Tidy, and directed him to form square; this was scarcely completed when the glittering arms of a regiment of cuirassiers were seen issuing from the smoke. The French horsemen paused for a moment at the sight of the scarlet uniforms of the 14th, and then turned to the right to attack a regiment of Brunswickers; but a volley from the Brunswick square repulsed the enemy, and Lieutenant-Colonel Tidy, with the view of giving confidence to the young soldiers of the 14th, drew their attention to the facility with which infantry could repulse cavalry The French cuirassiers rallied, and appeared inclined to charge the 14th, but were intimidated by the steady and determined bearing of the battalion."